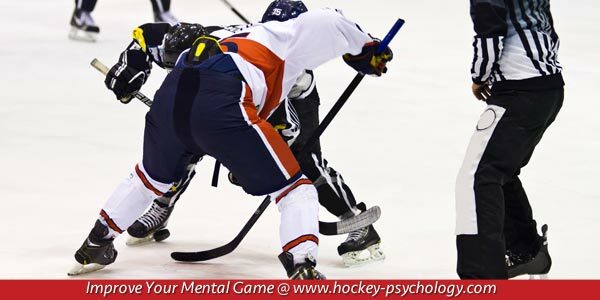 Self-confidence in hockey is the number one asset when discussing your mental game. Self-confidence separates great athletes from the good athletes. Self-confidence is how much you believe in your ability. 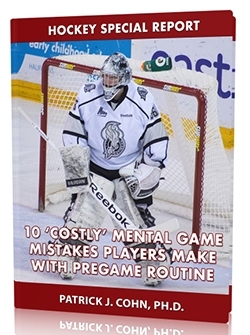 Many hockey players have fragile self-confidence, or lose confidence easily after mistakes. The two most common self-confidence blunders are high expectations and self-doubt. High expectations are demands you place on your performance that if you fail to achieve, you lose confidence in your game. You might have expectations to be the lead scorer or assists, for example. Expectations are usually set so high it’s hard for even top NHL players to reach them! When you fail to reach your expectations, you might assume you have failed in hockey at some level. Instead of having high expectations for yourself, you’ll want to set smaller, mini or process goals. Process goals are the little things you need to do to perform well. Some examples of process goals might include playing one shift at a time, track the puck well, and letting go of mistakes quickly. Before games you’ll want to take control of your confidence. One way is to review the reasons why you should feel confident. Think about your strengths as a hockey player or what you’ve accomplished in hockey. You can also think about drawing confidence from your practice and preparation, having good equipment, or support from parents and coaches. The bottom line, you want to be proactive with your hockey confidence. Choose to be confident before each game. If you find yourself doubting or questioning your ability or playing time, think about your strengths as a player and practice positive self-talk.